Sweet-tooths gather round. It's National Doughnut Week, and to celebrate we've got together some of the yummiest looking treats around. Warning: These pictures may make you hungry! 2. Nothing beats a classic jam filled doughnut just like these delicious looking treats from Morrisons. 3. A talented baker at Doughnut Plant creates tasty and organic doughnuts! 4. Tescos are pushing the boundaries of food as we know it...with cheese and onion flavoured doughnuts! 5. There's not denying that the Cronut was the treat of the year in 2013! The croissant-doughnut pastry delight which took the world by storm, was originally crafted by chef Dominique Ansel of the Dominique Ansel Bakery in New York. 6. Okay, we admit it...we officially started drooling when we spotted these ones. 7. 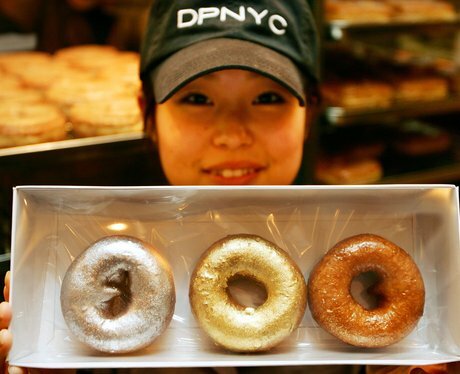 Glazed goodness is stocked in the window of a Doughnut Plant bakery in New York. 8. In India sweet doughnuts are cooked in a pot of oil and syrup. Yum! 9. Latin American Restaurant Las Iguans serves delicious looking Brazilian Churros Doughnuts. Dusted with cinnamon-sugar and served with chocolate ganache or dulce de leche dip – these are a real treat! 10. Handmade daily Crosstown Doughnuts, take the tasty dessert to another level. 11. Arrgh! Please don't make us pick just one! 12. Syrup - check, cream - check! 13. Doughnuts don't have to round you know. Morrisons have created cream filled finger doughnuts. Nice. 14. News just in! Dirty Burger has also started doing Dirty Doughnuts, with flavours changing daily! 16. From peacan to poppy seed, Dirty Doughnuts have created a flavour to suit every taste. 17. Square doughnuts? Now we really have seen it all. 18. Pumpkin honey doughnuts bring in elements from both Hanukkah and Thanksgiving. The recipe combines both the classic fried doughnut of Hanukkah and the traditional pumpkin pie of Thanksgiving. 19. The geniuses at Crosstown Doughnuts have created a range of flavours incluing the chilli doughnut. 20. This glazed berry compote doughnut wouldn't last two minutes in the Heart office! 21. Will someone please bring us these NOW!